locomente...: Best Days of my Life! I am wondering how friends understand silence? How do they hear the unspoken? Does my face give away what I think or do my friends know me so much that they could put words to my feelings? When I met them, I wondered if time freezes for friends. Whenever we meet our childhood friends, we turn into child again. Hours might pass by unnoticed. Time to say another goodbye would come. Reluctantly, we would live adorning a faint smile in our face. Those beautiful days when the travels were planned by our parents/elders... when we could rest on mommy’s lap anytime we wish for; the most comfortable cushion! Ah! Those sweet days when there were so many reasons to feel happy... After all, those were the best days of my (anyone’s) life! Those days of childhood and adolescence! PS: A beautiful Saturday it was! I met loads of friends... And here I am feeling nostalgic at this time of night... And it’s friendship’s day today. Every adult wishes for the same thing that is to go back and be a child again .. Awesome post.. All the Best for BAT .. It is said, The best kind of friend is the one you could sit on a porch with, never saying a word, and walk away feeling like that was the best conversation you've had. But rare to have one like that..
Yeh kaagaz ki kashti, yeh baarish ka paani..A universal dream to get back the childhood. Well brought out. Firstly I was also once actively a part of blog-a-ton. The name brought back lovely memories. And yes we all have to cherish these memories and perhaps play catch up on friendship days like these to rekindle the happiness.. 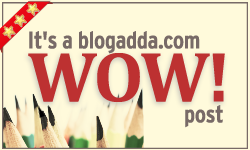 I was thinking of discussing our posts on blogadda wow thread. game for it? Friends are part and parcel of our life! nice one. We all wish for the same,Satya.... Very beautifully penned!! ATB for BAT!